There has been early chatter that Incredibles 2 relies on nostalgia to achieve its ends. Let me be perfectly clear, I understand that (1) we’re in the middle of a nostalgia driven resurgence of a great many properties come back to life from the past and (2) we’re in the midst of a generational shift where marketers and businesses are targeting a shift of buying power to capitalize on that nostalgia factor. NOW HEAR THIS: it’s not nostalgia if it’s something that you never got that you always wanted more of. Welcome to Disney/Pixar’s Incredibles 2. It’s been 14 years since the original film absolutely wowed with its near perfection. It’s a fact that you’re not so subtly reminded of by a quick intro from Craig T. Nelson (Mr. Incredible), Holly Hunter (Elastigirl) and Samuel L. Jackson (Frozone) that thanks you for coming and acknowledges that time gap. Fourteen years is not nothing. It’s nearly on the scale of the gap (16 years) between Return of the Jedi and The Phantom Menace—which in my mind felt like an eternity. To return to form, and pick up right where you left off with nearly the same amount of success would be an achievement indeed. 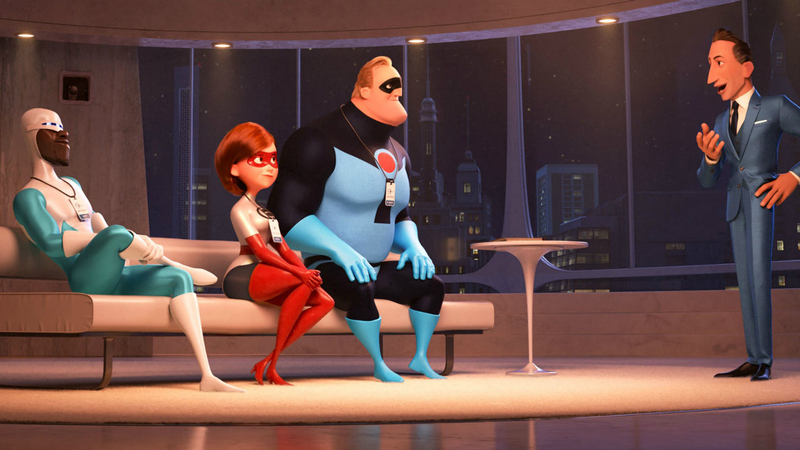 Guess what, Incredibles 2 does just that, and a few of the highs might be even higher. To replicate something great, it’s ideal to start with the same ingredients to your original formula. Incredibles 2 benefits from bringing back all (sorry Jason Lee) of the original voice cast and writer/director Brad Bird. That achieved, continue to offer something fresh while building on your original successes. Check and check. Give your audience what it wants! CHECK. 2004’s The Incredibles was an incredibly fresh take on the superhero genre. It presented the scenario prompt: What if superheroes were real? and ran with it. If superheroes were real, they’d create a lot of collateral damage, and knowing people (as we all do), they’d get the tights sued off their super butts. So, being super was outlawed, and that set the first film up brilliantly. You might recall, the original ends with Rick Dicker, the Incredibles government handler, saying “Nice job, Bob” after the family defeats Syndrome’s killer robot, and people are happy to have heroes back. The family returns to their lives, better for the experiences they’ve gone through that have led to their coming together as not only a family, but as a team. And then the Underminer shows up monologuing and saying villainish things. But the Incredibles are ready for action. Yeah, well, forget all that. Incredibles 2 pick up literally where we left off with a long action sequence with the Incredibles battling the Underminer. The film sets itself up by quickly subverting several of the plot arc victories from the original. The parents revert to being parents and try to keep their kids out of the action, while the kids continue to be a part of things that involve their incredible abilities. And the public quickly re-loses faith in supers, turns entirely cynical again, and the family is forced back into hiding their superpowers. We’re right back where we started. I’m not sure this makes sense, but it allows for a new plot to drive the action of this film: getting people to change their perception of supers so that being super won’t be illegal any more (i.e., let them come out and play). The franchise has also always been about family and relationship dynamics. It recognizes and acknowledges that even families who have a lot or who have incredible things or circumstances suffer the same difficulties that everyone does. The original dealt with issues of middle-age, white collar dissatisfaction and disillusionment, primarily driven from the perspective of Mr. Incredible, his unwillingness to give up the thrills of his youth, his inability to accept an average job, his dissatisfaction with a simple home life, and the divide that can grow between partners when there’s a lack of open and honest communication. I know this sounds like a lot for a kid’s movie, but it’s all there. 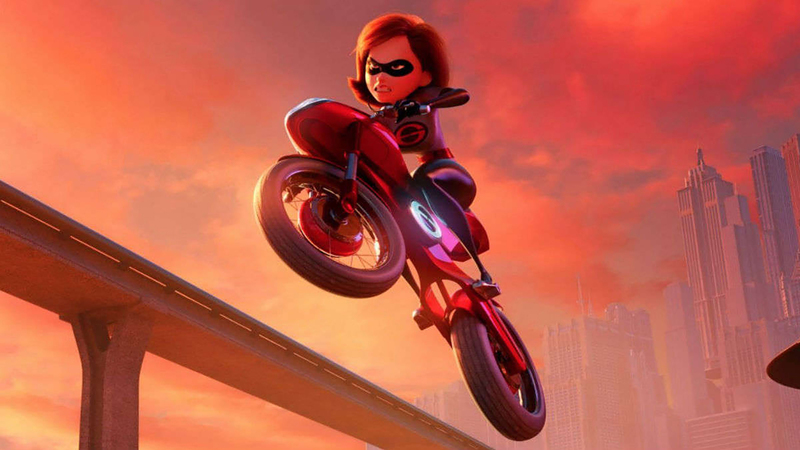 Interestingly, Incredibles 2 subverts the original storyline and allows Elastigirl (Hunter) to take the spotlight. She’s the one given the opportunity to recapture her youthful glory days while Mr. Incredible is forced to stay home, watch 3 kids, do the help with the homework, make meals and generally turn into a human zombie who gets none of the glory, but perhaps handles the most precious part of the equation (bringing up the kids in a happy and healthy way). Who cares about any of that though. Is the movie good? Yes. It’s excellent. It literally delivers what the audience wants which was more of what made the original great. The clever observations. The humor. The little details and asides, like when a background radio voice can be heard to say, “People have more trust in monkeys throwing darts than in Congress,” or like when Mr. Incredible swaps out a box of “Sugar Bombs” for “Fiber Os” at the breakfast table. It’s the same smart writing and filmmaking that made the original so fresh. Then there’s Jack Jack. JJ—can I call him JJ guys? Sure. JJ is oft-missing from the first film. The third Incredible child maligned for having no superpowers for 95% of the film … and he’s a baby. Boring. But then he has his moment in the spotlight and we know JJ has a lot to offer not only the crime fighting (or crime—hey, he could go bad) world, but the audience. JJ, appropriately, gets a ton more screentime this go around and doesn’t disappoint for a moment. Remember Porgs? Not for long. Remember K-2SO, the Alan Tudyk-voiced robot from Rogue One? These bit characters captured hearts and won audiences either with their quirky adorability or their amazing humor. JJ destroys where these two meh’d. Despite some familial argument scenes which ring a little too authentic and might be a tad overdrawn, the film mostly delivers on the demand for more left by the original. Jack Jack, whenever he’s the focus of the action, steals the show and ups what might have been a modest follow-up into a near-on-par, if long-delayed, sequel. He also sets the scene for more incredible spinoffs and sequels to come. Don’t be surprised if we get more now that the seal’s been broken. Times I said incredible in a non-titular, non-character name way in this review: 5.